The Bills announced that they have traded quarterback Cardale Jones to the Chargers for a conditional draft pick. It’s a seventh-rounder in either 2018 or ’19, reports Albert Breer of The MMQB (on Twitter). The Chargers had been in the market to acquire another quarterback to compete for a spot behind starter Philip Rivers, having worked out veteran Robert Griffin III on Tuesday. While the Bolts’ meeting with RG3 went well, they’ve elected to go with Jones, who’s only a year removed from joining the Bills as a fourth-round pick. As a rookie, the former Ohio State star worked with Chargers head coach Anthony Lynn, who was the Bills’ offensive coordinator last year. On the heels of Rex Ryan‘s firing, Lynn served as the Bills’ interim head coach in Week 17 – a 30-10 loss to the Jets in which Jones saw his first pro action. The 24-year-old completed 6 of 11 passes for 96 yards and an interception. The offseason regime change in Buffalo clearly helped lead to Jones’ demise with the club. The general manager who selected Jones, Doug Whaley, lost his job after the draft this year. Before that, the Bills, led by new head coach Sean McDermott, used a fifth-round pick on ex-Pitt standout Nathan Peterman. With Tyrod Taylor entrenched as the starter and veteran T.J. Yates also in the fold, there was no longer room for Jones in Buffalo. He’ll now push for a place behind Rivers, whose primary backup is Kellen Clemens. The Chargers also have developmental QBs Mike Bercovici and Eli Jenkins on hand. Guess they weren’t enamored with RG3. Jones could b a good pro. He needs time to develop and learn from a vet which he now will get great a great mentor in Rivers. 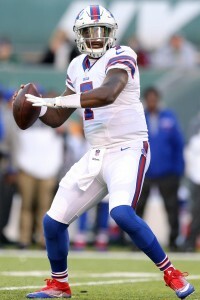 Remember when Whaley wanted to start Jones over Taylor and there was consideration that Jones would be the future QB in Buffalo? Doug Whaley will be missed.